BANZAI PIPELINE, Oahu, Hawaii/USA (Monday, December 18, 2017) – John John Florence (HAW) clinched the 2017 World Surf League (WSL) Title on Monday at the Billabong Pipe Masters, making him the first male surfer since the late Andy Irons (HAW) to successfully defend a maiden world title (Irons was ’02, ’03). Mark Richards (AUS, ’79 & ’80), Tom Carroll (AUS, ’83 & ’84) and Tom Curren (USA, ’85 & ‘86) are the only other male surfers to have achieved this feat. Florence’s season started out with strong results during the Australian leg, including his first event win of the year in Margaret River. After two 13th place finishes in Rio and Fiji, Florence steadily improved his results through the remainder of the season. With a 5th place in both Jeffreys Bay and Tahiti, followed by Semifinal berths at Trestles and in France, Florence reclaimed the Jeep Leader Jersey from closest rival Jordy Smith (ZAF). Smith went into the last event of the season ranked No. 3 and with a mathematical chance of clinching his first world title. The two-time WSL runner-up was defeated by 11-time world champion Kelly Slater (USA) in Round 3, finishing equal 13th in the event and dropping to No.4 on the yearend leaderboard. Going into the Billabong Pipe Masters, only four surfers remained in contention to clinch the title, but contenders Gabriel Medina (BRA), Julian Wilson (AUS), and Smith weren’t able to deliver the results needed to block Florence at his home break in Hawaii. Florence’s victory was sealed after Medina was eliminated today in the Quarterfinals at the hands of eventual event winner Jeremy Flores (FRA). Universally regarded as one of the best allround surfers, Florence has diligently worked at improving since qualifying for the elite WSL Championship Tour (CT) in 2011. A seven-year competitor on the CT, the surfer form Hawaii claimed his maiden title in 2016 with an early-season clinch in Portugal, having previously finished in the Top 5 twice before (4th in 2012 and 3rd in 2014). With this second title, the surfing world is eyeing the beginning of a new dynasty in high-performance surfing. “It’s been scary being that close in points to someone like Gabriel (Medina) who’s such a great surfer out here and a fierce competitor,” said Florence. “His comeback in Europe was amazing, he won two events in a row and then was right there in the title race. Surfing with him out here has been nerve racking but it would have been cool if we had a final for the title. “Winning the Pipe Masters against John John Florence like that in perfect Backdoor in the last seconds, that’s the best way to win,” Flores said. “I couldn’t think of any better way to win this Pipe Master. I’m so, so stoked and there’s a lot of emotions. Congrats to everyone. Congrats to John John (Florence) and Gabriel (Medina), these guys are next level. My goal was to win this event but this is crazy, I’m so happy. Colapinto captured a runner up finish at the first Vans Triple Crown jewel, the Hawaiian Pro at Haleiwa Ali‘i Beach Park, then went on to final at the second event, the Vans World Cup at Sunset Beach, for a commanding lead on the series. After Italo Ferreira (BRA) went down to Igarashi in the Quarterfinals the young American secured his victory. The world’s best surfers will return in 2018 with the kick-off event on the Gold Coast in Queensland, Australia in March. 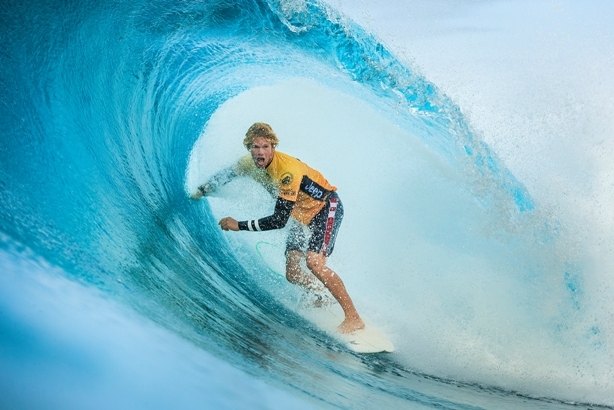 For highlights from the Billabong Pipe Masters check out WorldSurfLeague.com. Newly crowned World Surf League (WSL) Africa junior champions Jake Elkington and Sophie Bell will be the top seeds in the regional squad invited to compete in the prestigious World Junior Championship (WJC) in Australia in January 2018. The 2017 WSL Junior Qualifying Series (JQS) season was the busiest in the African region’s history and saw a record number of junior surfers competed in an unprecedented nine men’s and eight women’s contests which were staged at many of South Africa’s most iconic surf breaks. The WSL JQS is the first stepping-stone in the development of the next crop of elite professional competitors, giving surfers 18-and-under a platform to hone their skills, sample international competition and become comfortable travelling to surf events while making friends from all corners of the globe. The top four ranked men and top two ranked women from each of the seven WSL regions earn coveted invitations to compete in the annual World Junior Championship event which will be held in Kiama, Southern NSW. Previous champions include the likes of the late Andy Irons, Joel Parkinson, Gabriel Medina and South Africa’s Jordy Smith along with Sally Fitzgibbons and Jesse Miley-Dyer. Elkington dominated the men’s JQS, clinching three event titles in the five finals he contested and leading the rankings from start to finish. After finishing equal 25th at the 2016 WJC, the powerful natural-footer from Kommetjie is honoured to have qualified again and is looking forward to measuring his skills against his peers. “This is my final year as a junior surfer and it’s been the best year of my career so far. I’d never won a WSL Pro Junior event and this year I won three, which has been a huge confidence booster,” Elkington explained. “The highlight was winning the Vans Surf Pro Classic against a stacked field including top internationals. That has given me the belief to take on the Qualifying Series (QS) in 2018. Elkington will be joined in the WSL Africa men’s squad by experienced international campaigner Adin Masencamp (Strand), who finished equal 17th at the 2016 WJC and will be going all out to improve on that result in his final year in the junior rankings. Joshe Faulkner (Jeffreys Bay), winner of the Jordy Smith Cape Town Surf Pro, and Max Elkington (Kommetjie), Jake’s younger brother, will be making their debut appearances at the WJC, as will Ford van Jaarsveldt (Kommetjie) who won the final event of the year, the Billabong Junior Series at Seal Point, and has been granted a wildcard for Kiama. Sophie Bell (Salt Rock) and Kayla Nogueira (uMhlanga) fought a see-saw battle for supremacy in the 2017 WSL Africa junior women’s rankings, with Bell winning three and Nogueira two of the first five events of the season. Bell narrowly outscored the 14-year-old rising star in the remaining events and will be keen to improve on her equal 13th place finish in the 2016 WJC. “Getting second place in the first event in Port Elizabeth made me train harder for the next event which I ended up winning,” said Bell, who won both the junior and QS1000 women’s titles at the next stop in East London. The 2017 WSL World Junior Championship will be held from January 4-12 at Bombo Beach in Kiama on the Beautiful South Coast of NSW. It will feature the top 36 Men and 18 Women Junior Surfers from around the globe. For more information visit www.worldsurfleague.com or check the WSL App. Competing in incredible two to three metre Pipeline barrels, Smith found two unbelievably hollow tubes on the right-breaking Backdoor section of the reef to earn excellent scores of 8.67 and 7.90 that left his Australian opponents Bede Durbidge and Ethan Ewing in a combo situation where they were unable to overtake him with one ride. The performance was an ideal confidence booster for Smith who needs to reach the final of the season-ending event and for rankings leader John John Florence (HAW) and current No. 2 Gabriel Medina (BRA) to bow out early in order for the South African to clinch his maiden world title. Florence, who was loudly cheered by the partisan home crowd as he entered the water, started his world title campaign with a solid 13.50 (out of a possible 20) scoreline to take top position over Pipe Invitational winner Dusty Payne (HAW) and Brazil’s Wiggolly Dantas (BRA). Wearing the Jeep Leader yellow jersey, Florence looked confident and in rhythm at his home break and kept busy throughout the 30-minute match-up to secure his place in Round 3 and move one step closer to defending his World Title. South African born Benji Brand has had a phenomenal season in his adopted home base of Hawaii, clinching the WSL Hawaii / Tahiti Nui Regional title and then earning a wildcard into the Pipe Masters when he finished runner-up in the Pipe Invitational. The 21-year-old, who grew up surfing in Kommetjie and represented SA in several junior international events, took an early lead over Medina and fellow Brazilian Miguel Pupo. Pupo moved up into second place with a near-perfect 9.93, the highest single-wave score of the event so far, for a late takeoff into a cavernous Pipeline barrel and narrow exit. Medina also put on the pressure with an excellent 8.50 but Brand continued to hold the lead. In the end it was Pupo, who is ranked No. 23 and battling for requalification, who stole the win to advance to Round 3 with a 4.90 during an exchange in the final minute, sending Medina and Brand to elimination Round 2. 11X WSL Champion and 7X Billabong Pipe Master Kelly Slater (USA) made a triumphant return to competition today, wearing a contest jersey for the first time since July when he injured his foot in Jeffreys Bay, South Africa. The event was put on standby after Heat 9 when the winds shifted onshore and a call was made at 2:00 p.m. HST to call the competition off for the day. Event organizers will reconvene at 7:30 a.m. HST (7.30 p.m. South African time) on Tuesday to reassess the conditions and make the next call. A new NW swell will build Tuesday afternoon and peak on Wednesday with XXL size surf washing Pipe out (along with onshore N wind). Thursday and Friday will see a decreasing trend in swell with strong NE trades. A mid-size NW swell looks possible for the 17th-18th (Sun-Mon) with at least a chance for light wind. For more information, check out WorldSurfLeague.com and the WSL App.